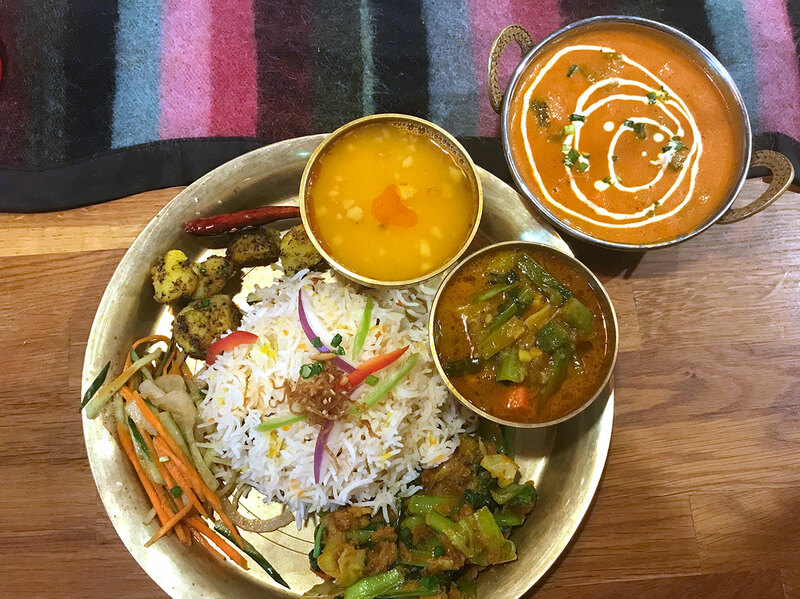 If you’re in Osaka searching for vegetarian or vegan Indian, Tibetan, and Nepali cuisine, look no further than Shinmachi. “Healthy and Spicy” is the motto of Nepal-Curry’s second-floor Siddhartha restaurant that opened a year ago in Shinmachi, Osaka, offering many options for vegetarians and vegans. At dinner, crispy lentil-floured papads come as a complimentary starter in this clean, modern Indian restaurant. The bite-sized vegetable onion-and-potato pakoras (¥590) are a light and crispy fried treat that come with ketchup and mayo, or a variety of chutneys if requested. The hearty dish of vegetable biryani (¥850) is jasmine rice cooked with red and green bell peppers and lotus root blended with aromatic spices, including cardamom and coriander, and topped with almond slices. Several vegetable curries and dals are available. The alu began (¥890) is a smooth blend of soft potatoes and eggplant chunks, and the palak paneer (¥1,050) is the classic dish of spinach with homemade cheese chunks. All items come with your preferred spice level. There are also soups and unique salads, including a soybean salad called bhatmas sadeko (¥350), and even chomin (chow mein) for ¥750. The restaurant is available for private parties. This simple, cozy restaurant with upbeat, modern Indian music in the background and images of Indian gods on the walls makes you feel like a guest in the home of the friendly staff. The lunch set always has a vegetable curry option – chunky bits of potato and cauliflower, peas, carrots, and green onions topped with yogurt and cooked to your spice preference. A clay oven turns out enormous pieces of puffy, fresh naan bread, and the set comes with cabbage salad, rice, red chutney, and a lentil papad (¥880). For dinner, crispy deep-fried vegetable samosas of potato and peas are a treat. Chana masala curry (¥900) with its chickpeas and tomatoes blended with spices, including cumin and garam masala, is an excellent and hearty choice. There is also a vegetarian dinner set (¥1,550) that includes aloo gobi curry, potatoes, and cauliflower cooked with onion, tomatoes, and spices or sag paneer curry with spinach and cheese chunks. The set comes with naan, rice, salad, papad and a lassi or chai. The dazzling array of golden Buddha statues, Buddhist thangka paintings and other Tibetan ornaments and artworks that pack this unique restaurant makes it feel like you’re eating in a fine art gallery. Sit low on cushions and woven rugs at ornately painted tables or at Western tables beneath strings of colorful Tibetan flags, prayer wheels, and lanterns. For dinner, try the veggie momos – steamed dumplings with spinach and onion filling served with spicy red chili sauce (¥700). There’s a fresh tomato salad drizzled with olive oil, rock salt and herbs (¥480), and their bhatmas sadeko (¥480) (a salad of crunchy toasted soybeans) is loaded with ginger, garlic, spices, cucumber, red peppers, and onions. The Nepali Set (¥1,500) features a serving of dahl and a rich stew with lotus root, chard, and green beans flavored with orange. It comes with seasoned vegetables and basmati rice with a colorful medley of delicate shaved carrots, cucumber, peppers, onions and a hint of rose and bay leaf. A small store sells chakra bowls and fine statues, music, and jewelry.